Thamesmead was intended to be a vibrant, riverside community in south-east London. Forty years after being built, the area is known as a notorious hub of fraud, dubbed Little Lagos because of its association with west African criminal gangs, says Phil Kemp. On the south bank of the Thames to the east of Greenwich stand smart, futuristic-looking tower blocks of riverside apartments. 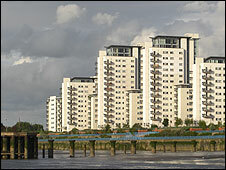 They are the most recent phase of development in the new town, Thamesmead, which was 40 years old last year. It was built on a wave of optimism in the 1960s, as a panacea to London's overcrowded inner city areas, and opened in a blaze of publicity. But in the past five years it has earned a reputation as the fraud capital of the UK. Andrew Goodwill, director of the Third Man Group, a fraud prevention service which screens internet transactions to help retailers detect credit card fraud, said the company's database revealed Thamesmead's SE28 to have the worst record of any postcode in the country. "Last year we indicated it was the capital in the UK for credit card fraud. And actually we went as far as to say it was probably the capital of Europe for credit card fraud as well." He said the company had identified an entire street in the town where there was evidence of people being involved in fraud at every address. New flats built in the past few years have lured young, aspirant professionals to the area, but residents suspect they have also attracted fraudsters. "There was clearly at one point a ring of people who were raiding the letter-boxes," says Anne-Marie Griffin, who bought a flat with her husband Barry under a shared ownership scheme in 2005. "There were multiple letter-boxes that were just ripped open but also piles and piles of mail on their hall floors in all different names for all different kinds of companies," she said. Credit cards and benefit claims offer rich pickings for fraudsters with access to a genuine address and letter-box. "My husband gets quite a lot of deliveries for work and one day, the delivery company rang up and said: 'I'm just checking who you are - we've got a parcel and we wanted to make sure more or less that we think you're OK'," says Ms Griffin. She says the company told her it had refused to deliver to the area because the person answering the door would ask who the parcel was addressed to and then sort through a stack of credit cards all under different names. And this was not a problem that was unique to the Griffins' estate. Another resident at a development further up the Thames said the concierge office for his apartment block looked like an Aladdin's cave of electrical goods such as mobile phones, plasma TVs and cameras. A local postman said he could recall having to deliver seven or eight mobile phones to the same address in the same week. One theory why this part of south-east London has attracted fraud is because of its connections to west African gangs, earning its nickname Little Lagos. In a report by think tank Chatham House, a British police officer said that convicted fraudsters tended to escape significant punishments and tended to abscond fairly frequently while on bail. Those who do not flee may have British passports or families resident in the UK, and they regard a short prison sentence as an "occupational hazard", worth risking for the large proceeds of fraud they can enjoy when they get out. Once an area earns a reputation, it is reinforced as this kind of profile attracts more criminals. A former fraudster from southern Africa said that even before she became involved with a criminal gang using stolen credit cards and cashing cheques, she had heard of the town's reputation. "I used to hear people say if you go to Thamesmead anything you want, you will find it," she says, talking to the BBC at a park in south London. "I was preparing for my child. My partner wasn't there. I think that's what pushed me into doing it. I was desperate." She says she has now turned her back on her criminal past and is keen to discourage others from getting involved in fraud. And residents' groups say they have had some success in cleaning up the area with the help of the police and other local organisations. One such group is the Youth Awareness Programme run by Roy Gisby, who was a moonlighting construction worker when the first estates were being built in Thamesmead in the late 1960s. "If you give something a bad name then it will live up to that name," he says. "So Thamesmead was known as a troublesome area particularly with gangs." The concrete high-rises that surround the project were the setting for Stanley Kubrick's violent film, Clockwork Orange. Its bleak, futuristic depiction of violent youth has stained the town's reputation ever since. 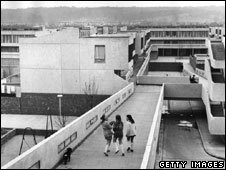 "A lot have grown up in Thamesmead. It's been here 40 years and some are quite proud of living in Thamesmead so I think things are changing," he said. "I don't see why you shouldn't be positive about Thamesmead." We were one of the first families to move in to Thamesmead in 1969 when I was just a baby and according to my Mum it was like paradise compared to the conditions she lived in in Peckham. It's so sad to see Thamesmead's reputation going from bad to even worse. It was a fantastic place to grow up in in the 70s and early 80s with playgrounds, lots of open spaces and Southmere lake and even though I've now lived in Norfolk for over 20 years I still think myself lucky to have spent my childhood there. I live there, and know only too well about the fraud committed by my 'neighbours'. I used to live in flats with multiple letterboxes and moved to another part of Thamesmead six years ago. While out buying stuff for my new place, I was asked to contact my credit card company. It turned out that someone had applied for a second credit card at my old address. Luckily, I'd already informed the credit card company that I was moving a few days previously and that had alerted them. However, not long after that, I arranged a small loan with my bank, only for it to be turned down. I got a full credit report and found that at my previous address, four different names had defaulted on various payments and one had received a CCJ. As a result, it took me a year to clear MY name. I even went to the police with the report, only to be told that there was not much they could do, which left me feeling a bit disgruntled. "As you sow, so shall you reap." A monstrous inhuman, windswept, concrete monstrosity and eyesore devoid of trees where no one would aspire to live and only the poor are forced to live is the unsurprising cause of this Little Lagos. You surely won't find the affluent or the educated wanting to live in this location. I was always led to believe that the underpass used in the picture at the top was actually in Aylesbury, not Thamesmead. One of the few claims to fame my hometown has! Well I actually currently live in Thamesmead and I find it a very nice area to live in, the open spaces, the closeness to the Thames, and the availability of local shops etc make it a very comfortable place to live , this report on gangs and fraud shocks me as i had no idea , I've never lived in a flat in Thamesmead, I moved into the area over four years ago on a shared ownership scheme and overall over the last few years I've been very happy with the area , I work in central London and I find the transport links quite suitable for the area as i use the local Plumstead station. It just makes me so angry that the law seems to have its hands tied regarding known criminal activity. I work for the prison service and cannot fathom why criminals who have committed, what the public would consider, serious crime, ie GBH, assault, human trafficking etc are let out on bail and then, 'what a surprise' they don't turn up for court and we have an offender mixing with the public. To have an area like Thamesmead, known for the gangs etc to be able to openly have this reputation and still function in this manner, just shows the lack of concern MP's and the one's high up who implement the law, have for the ordinary public. If a gang is arrested who's origin is from another country, just send them back, why do we, the taxpayer, have to pay for them? I lived in Thamesmead in the late 70s for about three years - couldn't wait to get out even then, so when the chance came to move to Northampton I took it. The walkways always left you with a sense of fear, especially after dark, and were covered in graffiti, as did the stairwells and even the lifts. Although I must admit that the flat I had was great and my close neighbours were ok.